Learn how to create an enterprise search solution over private, heterogenous content using Azure Search. Tutorials, API references, and other docs show you how to consolidate searchable content into a single fast index, queryable using simple-to-advanced syntax for a broad range of scenarios. 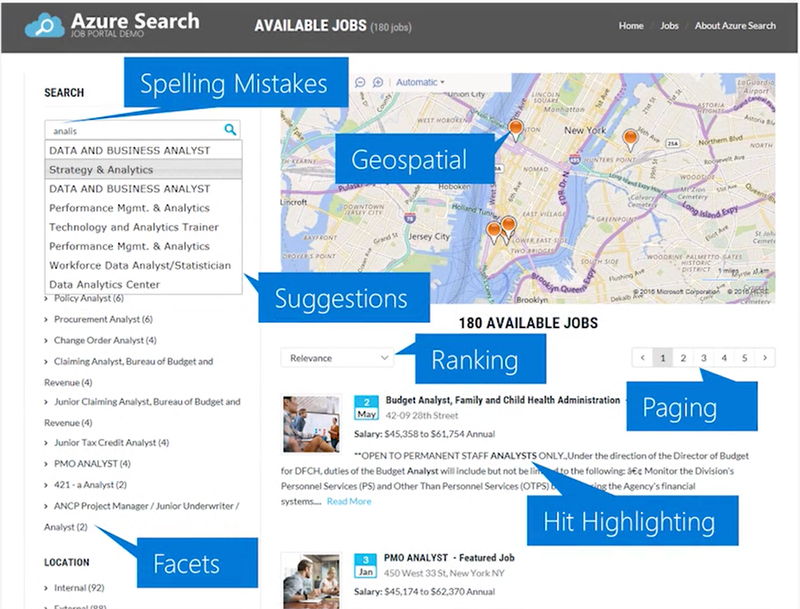 New cognitive search preview. Use a pre-release REST API to bind AI-powered algorithms to the indexing pipeline. Extract data, and invoke natural language and image processing to transform raw unstructured content into searchable content in an Azure Search index. Explore cognitive search using resources and sample data or learn more in Concepts. Start with a Search service in the portal, then define, load, and query indexes in C# or REST. Code in .NET or REST, or try the portal for quick concept testing.